After nearly 16 years of marriage and months of soul-searching, Dan Wahlberg and his wife decided to go their separate ways. This spring, Wahlberg's wife filed for divorce. They hired attorneys and put their three-bedroom Paradise Hills house up for sale. They retreated to separate bedrooms to watch TV and stopped sharing meals. But even as they tried to disentangle emotionally, physically they were locked in an awkward embrace. Neither could afford to move out. They owe $290,000 on their house at a time when nearby homes are listed for as much as $80,000 less. They're behind on the mortgage and are trying to avoid foreclosure by selling the house for less than they owe. They have little money to set up new households, pay off credit cards and cover divorce attorneys' fees. Getting divorced is one of life's most difficult passages, and the housing market meltdown is making it tougher. With home prices plunging and foreclosures soaring, divorcing couples are finding it harder to rid themselves of jointly owned property – and as a result, each other. Divorce is painful, to the heart and the bank account. In a community property state such as California, assets acquired during the marriage – from property to retirement funds – get split in two. The shaky economy amplifies the impact. Typically, divorces spike at times of high unemployment. But when economic conditions get bad enough, the opposite can occur: Couples conclude that they're better off staying together. The last time this happened was during the Great Depression, when the divorce rate fell despite a surge in marital conflict, domestic violence and desertion. A similar phenomenon might be going on now, Coontz said. Divorce filings hit a recent peak in San Diego County in fiscal 2005-06, which runs from July 1 to June 30, when about 14,700 couples filed for divorce. That coincides with the time that the median home price hit an all-time high of $517,500. As the economy has worsened and home prices have dropped, so have divorce filings. From July 2007 to March, 10,224 couples filed for divorce, down 5.7 percent from the same period in 2005-06. “Though it's too early to say definitely, I would not be surprised at all to return to a situation such as we had during the Great Depression, where even though you see an increase in marital breakdown, you don't see an increase in marital break-ups,” Coontz said. Gordon said his mediation business has declined by half since January. Other divorce lawyers said fewer people are signing up because they can't afford the fees. During the real estate boom, some divorce lawyers would collect their fees from the proceeds of a home sale, a bet that few are willing to make anymore. “People are living on separate sides of the house. They're dating other people while living together because they don't have the funds to pursue divorce,” Gordon said. 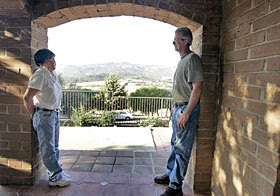 Ralph Griggs, 56, and his wife, Anne Smith-Griggs, 59, thought they'd live on their 9-acre ranch in Alpine for the rest of their lives. Working on the spread, which had been in Ralph's family for 40 years, was a labor of love for both. Anne, a quality control assistant for a construction company, found it therapeutic to spend weekends clearing brush. Ralph handled repairs and renovations, including installing new windows and tile, updating bathrooms and planting trees with an equity loan they took out last year. “It will break both of our hearts leaving here,” said Anne, who has a grown son from a previous marriage. Even while they were busy fixing up the house, their marriage, always volatile, was crumbling. They had a tumultuous parting. For several months, Ralph lived at a hotel in Pine Valley. But eventually, they concluded that they needed each other, at least to pay the mortgage and prepare the property for sale. A few weeks ago, Ralph moved back to the land, into a trailer parked 200 yards away from the main house. Both credit Gordon, their divorce mediator, with helping to diffuse tension between them and make it possible for them to cooperate while trying to sell the home, which is listed for $595,000. At their ages, they both say they will never be able to afford a property as beautiful as the one they now have. “Leaving the house would be a fate worse than death,” Ralph said. Anne said the home is the one thing on which they completely agree. With divorces more difficult to resolve, couples are having to get more creative in their settlements. Lawyers are also being asked to draft more postnuptial agreements, contracts between divorced couples who want to continue to jointly own family businesses or houses until the market improves. Couples who can afford it are trying “birdnesting,” an arrangement in which the children stay in the family home and the parents take turns living there. For Bill, 51, splitting up with his wife of seven years meant moving into a warehouse where he stores equipment for his catering business. Bill asked that his last name not be used because his landlord would likely kick him out. Bill knew his wife wanted to keep the house in Imperial Beach with its yard for her two dogs. But they are $100,000 upside down on the mortgage. His wife is unemployed, so refinancing was out of the question. Bill agreed to pay her $3,000 to cover the mortgage and her living expenses for three years. They will remain legally separated, rather than divorced, so she can continue to be covered on his health insurance policy. He bought a bed on Craigslist and set up living quarters in a spare office in the warehouse. “As depressing as it is, I just have to face reality that I may be here for another year and a half,” he said. Even with Bill's financial support, his wife knows she's living on borrowed time. Their adjustable rate mortgage will reset, around the time her spousal support runs out. “2011 is going to be a scary year,” she said. Divorce attorneys say it's best for couples to live apart when they are getting divorced. Tempers can flare. Living apart allows each to begin to build new lives. Dan Wahlberg wants nothing more. The nearly 1,400-square-foot home that he and his wife bought 12 years ago feels smaller every day. He gets up for work at 4:30 a.m. and leaves for work without seeing his wife. He says he rarely goes in the kitchen and eats out or brings take-out to his room. He has moved some belongings into storage, preparing for foreclosure in case the house, listed at $250,000, doesn't sell. He recently started dating again, though his girlfriend isn't thrilled that he's still living with his wife. “I've explained it to her that we're only doing this for economic reasons. There will be no reconciling,” he said. About the only thing he and his wife still do for each other is put water in the dog's bowl, he said. Yet after so many years of sharing so much, it feels strange to bump into one another at home and hardly speak. Even passing in the hallway makes him tense. “When I stay out late, do I need to explain where I've been? Even though we're living together, we're not really together,” he said. Wahlberg said the bank that holds the mortgage wouldn't even consider approving a short sale until they'd defaulted. He recently stopped paying the mortgage. Ironically, escaping his monthly house payment may free up enough cash to rent an apartment soon.